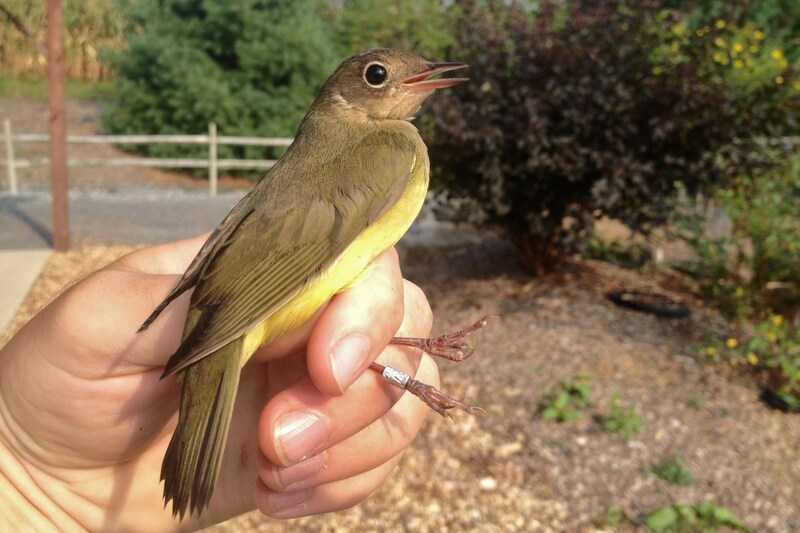 Today was the kick-off to our 2013 fall banding season at Penn State University’s Big Hollow site, located within the 370 acre arboretum. We will be banding multiple mornings per week, usually Tuesday and Thursday, and the public is welcome to attend. Today’s highlight was a juvenile Connecticut Warbler, and I pretty much went nuts when I saw another bander pull it out of the bag after we all came back to the pavilion after a net run. 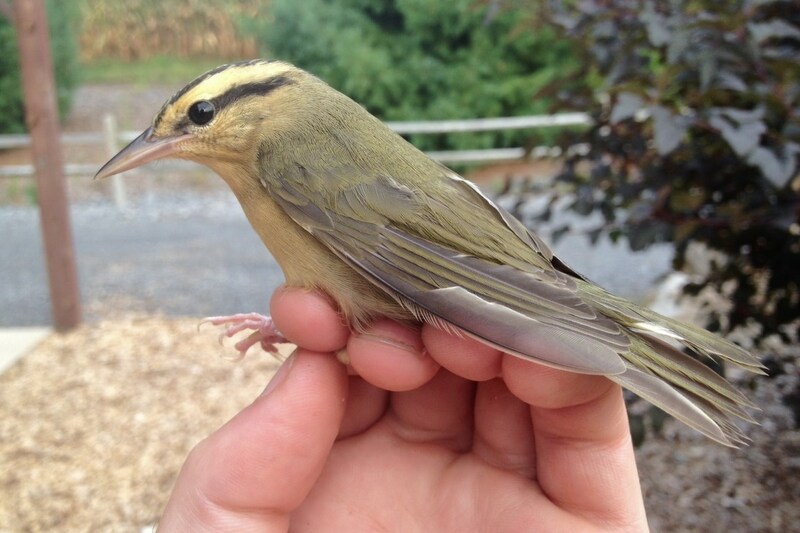 This shy and elusive warbler species is only reported one or two times per year in central Pennsylvania. Some years no birder is able to find one in the region, so this really may be the best bird of the entire season even though it is just the first day! 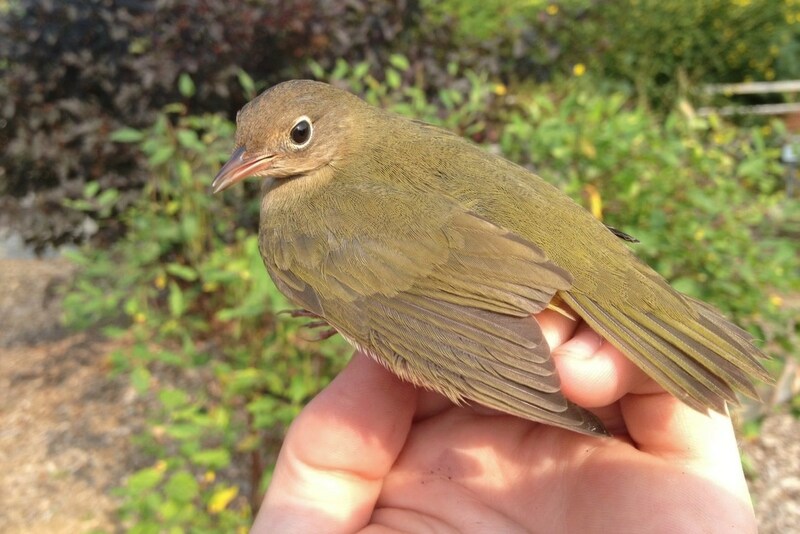 This is the second time I have seen a Connecticut Warbler in Centre County, although both times have been birds we captured in the mist nets in Big Hollow (which goes to show how secretive and difficult to find they are). However, Big Hollow may be a bit of a hotspot for them, as the goldenrod filled fields, brushy patches, forest edge, and the general abundance of dark, shadowy areas create the ideal migration habitat for the species and hopefully we may catch another one or even just come across one while birding the area. A total of 37 species were seen, heard, or captured in Big Hollow this morning and 32 individual birds were captured, processed, and banded of 11 different species. 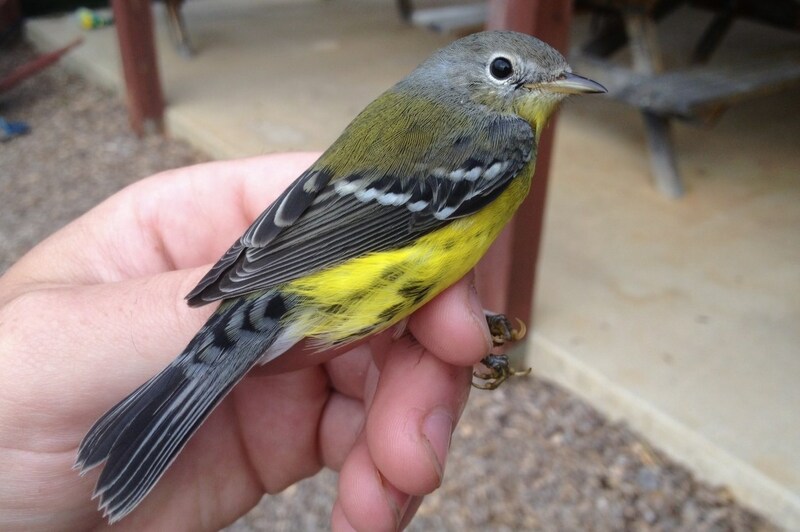 Of those, the most notable species banded were 2 Magnolia Warblers, 1 Worm-eating Warbler, and 2 Wood Thrush. Less exciting, but still fun to see in the hand were 1 Cedar Waxwing, 1 Eastern Towhee, 2 Northern Cardinals, 1 House Finch, and 1 American Goldfinch. Gray Catbirds are probably the most common species in Big Hollow, so it wasn’t too surprising that we caught 17 individuals. 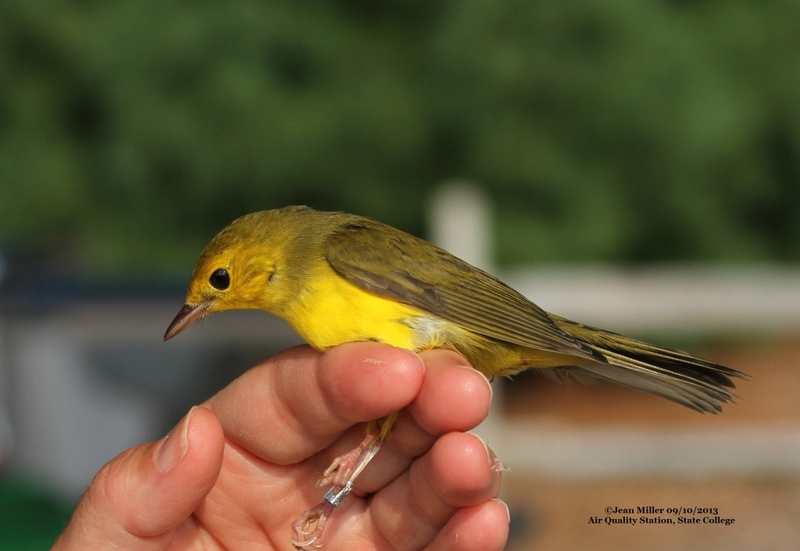 We also had two recaptures – both Northern Cardinals, one banded in August 2010 and the other banded in September 2010. One of the cardinals was actually recaptured from the exact same net it was caught in the first time, three years ago. That bird is likely a local breeder, but it’s nice to see that it has been around and doing well for a while. Hopefully in the next few weeks we might recapture a migrant species that has already used Big Hollow on its route in the past, or a foreign bird that was banded at another banding site!